The following A to Z of bouldering terms and terminology, taken from Bouldering Essentials, contains the definition of pretty much every word related to bouldering from the most basic to the obscure. If you think of any definitions that are missing get in touch. Antagonistic The antagonistic muscles are those responsible for pushing as opposed to pulling. Antihydral A skin drying agent that reduces the hand’s sweating. Ape Index The difference between your arm span and height. Approach Shoe A hybrid between a running shoe and a hiking boot. Arch The arched middle part of the sole of the foot that lies between the toes and the ankle. Or a steeply overhanging arete. Arete A protruding rock feature that is formed by the meeting of two planes. The opposite to a corner. Arm Bar A crack climbing technique in which an arm is inserted deep into the crack and secured by pressing the palm of the hand against one wall and the tricep/shoulder against the other. Backstep A technique in which one foot inside edges while the other outside edges. Similar to a dropknee. Back and Foot A method of climbing chimneys in which the back is pressed against one side while the feet push against the other. Barndoor An unintentional, uncontrolled rotation away from the rock. Belaying Paying out or taking in the rope while another climber climbs. Beta A description of how to climb a specific problem, usually refers to the best (ie. easiest) way. Body Tension The ability to keep the feet on their foot holds when climbing steep rock. Core strength and technique are components of body tension. Body Position The position of the body relative to the hand and foot holds. Bolt On A resin or wood hold that is bolted to the surface of a climbing wall. Boss A rounded lump protruding from the rock that can be used as a hand hold. Bouldering Pad A rectangular crash mat that consists of multiple layers of foam covered in a heavy duty material. The pad is placed where the climber is expected to fall to cushion their landing (AKA bouldering mat). Bicycle A technique in which one foot pushes a hold conventionally while the other foot toe hooks the same, or a nearby, hold. Most commonly used when climbing roofs (AKA clamp). Break A horizontal, often rounded, crack. Bridging Pushing onwards with the hands and/or feet. Usually done in corners or grooves, but can also be done between two protruding holds (AKA stemming). Buildering Bouldering on buildings or other man-made structures. Bulge A rounded roof or overhang. Bump Making two consecutive hand moves with the same hand (AKA going again). Buttress A prominent rock face protruding from a crag. Callouses Areas of hard skin that can develop on the fingers or palm. Campus Board A training device that consists of a small overhanging board crossed by wooden rungs at regular intervals. The idea is to climb it without using the feet so as to develop arm and finger strength. Campusing Climbing without using the feet. Centre of Gravity The theoretical point where the entire mass of a body is concentrated (abbreviated to CoG). Chalk Magnesium Carbonate (MgCO₃) is a white powder that is used to absorb sweat from a climber’s hands. Chalk Bag A small pouch for holding chalk that is hung on a belt tied around the waist. Chalk Bucket A large chalk bag designed to be left on the ground. Chalk Ball A small round mesh bag filled with chalk. Chalking Up Coating the hands with chalk. Chicken Head A protruding lump of rock, most common on granite. Chicken Wing A jamming technique in which the arm is bent and inserted into a crack elbow first with the palm pressed against one wall while the tricep/shoulder presses against the other. Similar to an arm bar. Chipping Creating or enhancing a climbing hold. The worst sin a climber can commit. Cheatstone A stone placed at the bottom of a problem to bring the starting holds into reach. Chimney A wide crack that is large enough to climb into. Choss Loose, dirty or otherwise unappealing rock. Chunking Breaking down a move or problem into small sections to figure out how to climb it. Circuit Either a grouping of problems of similar difficulty (most common in Fontainebleau, France) or a long problem, often a loop, climbed on an indoor wall to train endurance. Climbing Shoes Tight fitting, rubber covered shoes designed for rock climbing. Cobble An embedded stone that is used as a hold. Usually rounded and smooth. Conditions The suitability of the temperate, humidity, wind etc. for climbing. Conglomerate A sedimentary rock type that is mainly composed of embedded round stones (cobbles). Compression A technique for climbing symmetrical features by placing a hand (or foot) on either side and pulling hard to hold the body in place. Core The muscles of the stomach, lower back and legs. Corner A feature formed where two planes meet at roughly right angles (AKA dihedral). Crag A generic term for a climbing or bouldering area. May also refer specifically to an outcrop of rock. Crimp A small edge. Also a powerful grip in which the second finger joint is bent sharply and the thumb presses onto the index finger (AKA full crimp). Cross Through A traversing move in which one hand reaches past (over or under) the other to reach the next hold. Crux A problem’s hardest move. Cusp A grip in which a protruding hold is squeezed, over the top or around the side, between the fingers and palm, with the fingers on the side nearest the body (AKA guppy). Cutting Loose When both feet swing off the rock and all the climber’s weight is taken by the hands. Crystal A small piece of quartz that can be used as a hold, common on some types of granite. Dab When, mid ascent, a climber brushes off or hits into their spotter, a tree, the ground, another boulder or a pad. Deadhang To hang with straight arms without any assistance from the feet. Deadpoint The instant in a movement when the body is moving neither up nor down, the ideal time to grab a hold. Deep Water Soloing Climbing above water without a rope, often abbreviated to DWS. Descent Route The way down from a boulder (AKA downclimb). Diagonal Stride Using opposing limbs in coordination. Down Climbing Reversing down a problem either as a retreat or as a means of getting off a boulder. Double Dyno A dyno in which the target hold or holds are simultaneously grabbed with both hands. Dropknee When one foot inside edges while the other outside edges, the knee of the outside edging leg is lowered so that the feet are pushing away from each other rather than down (AKA Egyptian). Dynamic Any move that uses momentum. Dyno An all out leap during which the whole body is airborne and has, very briefly, no contact with the rock. Edge A flat horizontal hold. Edging Standing on an edge. Eliminate A contrived problem in which certain holds are deemed off limits to make the climbing harder. Featured Wall An indoor wall that is designed to resemble real rock. Fingerboard A small wooden or resin board covered in hand holds that is hung from to train finger strength. Finger Jam A jam in which the fingers are inserted into a crack and rotated until they are wedged. Finger Tape Strong tape designed to provide support to injured fingers. First Ascent The first time a boulder problem is climbed. Figure Four A very rarely used technique for making a long static reach from a positive hold. Involves hooking a leg over the holding arm. Fist Jam A jam in which the fist is inserted into a crack. Flagging To dangle one leg in the air for balance, usually done on steep rock. Flake A thin, partially detached, slice of rock. Flapper When a large chunk of skin is ripped off, usually during a dynamic move. Flared A crack with sides that taper outwards making it very difficult to jam. Flash To climb a problem on the first try from start to finish. Fontainebleau The famous bouldering area just south of Paris, France (AKA Font or Bleau). Also a system for grading boulder problems, the grade is often prefixed with ‘Font‘. Footwork The art of using the feet well. Foot Cam A technique in which the foot is rotated around the heel until it wedges, works well in horizontal cracks or breaks . Foot Jam A jamming technique in which the foot is wedged, toes first, into a crack. Foot Swap Replacing one foot for another on a foot hold. Friction The force created when skin or rubber is pressed into the rock. Frogging Getting the hips parallel and as close as possible to the wall with the knees pointing out to the sides. Front Lever A strength exercise that involves hanging from a bar, raising the body so it’s horizontal and holding that position for as long as possible. Front Pointing Standing on a hold with the tip of the big toe. Full-body Stem Climbing a very wide crack with the hands on one wall and feet on the other. Gabbro A coarse grained, rough igneous rock. Gaston Gripping a vertical hold with the arm bent at the elbow and the hand, thumb down, pulling the hold away from the body. Golfer’s Elbow Aches and pains in the inside of the elbows caused by a lack of balance between the pushing and pulling muscles. Grades An indication of how difficult it is to climb a problem assuming good conditions and the best sequence. Granite A rough, igneous rock that consists mainly of quartz, mica, and feldspar. Gritstone A hard, coarse grained form of sandstone (AKA grit). Ground Up Attempting and climbing a problem or route without inspecting it from a rope and starting from the ground on each attempt. Guidebook A book containing information about a bouldering area (or areas) including details of the problems, directions, maps and photos. Half Crimp A versatile grip in which the fingers are partially bent. 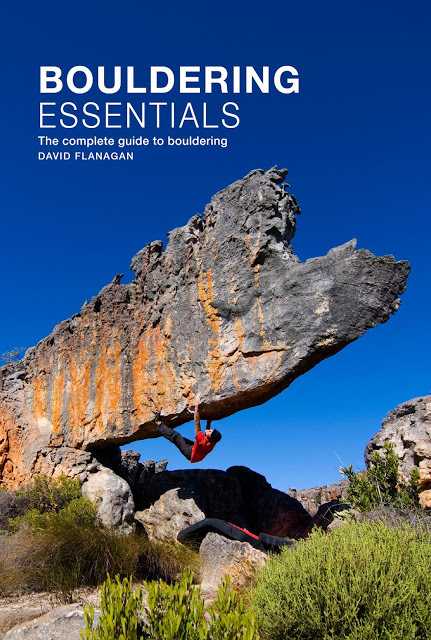 It’s a compromise between open handing and crimping and is particularly useful on flat holds. Hand Jam A jam in which an open hand is inserted into a crack and pressed against the sides with the knuckles against one side, fingertips and palm against the other. Hand Stacking An advanced technique for hand jamming in offwidth cracks. Headpointing Climbing a route or problem after rehearsing the moves on a top rope first. Heel Hooking Placing the heel of the foot on a hold and using it like an extra hand. Heel-toe Jam A jam used in wide cracks. Highball A tall boulder problem. Hueco A large rounded pocket. Inside Edge The straight edge running along the inside of the big toe. Intermediate A small hold that is used briefly during a reach to a distant hold. Jamming Wedging a body part into a crack. Jug A large incut hold (AKA bucket). Jump A dynamic movement in which one hand stays on while both feet leave the rock. There is at least one point of contact at all times. Jump Start Jumping from the ground to the starting holds of a problem (AKA French start). Kipping Kicking the legs to generate momentum when hanging from the arms. Kneebars A jam that leverages between foot and knee. The foot stands on a conventional hold while the knee (really the front or side of the lower thigh) presses into a corner, overlap or large protruding hold. Lace Ups Climbing shoes that are fastened with laces. Landing The landing zone beneath a problem. Launch Pad A small bouldering pad that is designed to protect the start of a problem or as a supplement to other larger pads. Layback A technique for climbing continuous vertical features such as cracks, flakes or aretes, that relies on opposition created by pulling with the hands and pushing with the feet (AKA liebacking). Link Up Combining sections or whole problems together to create a more difficult challenge. Linking Practising sections of a problem to prepare for the complete ascent from start to finish. Limestone A sedimentary rock composed of skeletal fragments of marine organisms such as coral. Liquid Chalk A mix of alcohol and chalk that is rubbed into the hands to coat them with chalk. Lock Off A static reach done with the holding arm bent sharply. Lowball A low or short boulder problem. Mantel A method of getting from hanging the lip of a boulder or ledge to standing on it (short for mantel-shelf). Also a verb, “mantel the ledge“. Matching Placing both hands side by side on a hold (AKA sharing). Midge Tiny (1-4mm) flying insects which are most common in temperate climates during the summer months on humid, still days. Mono A small pocket that can only fit one finger. Monzonite An igneous rock type, similar to granite. Morpho A climb or move whose difficulty is highly dependent on the body shape or size of the climber. Usually code for “hard for the short”. No Hands Rest An excellent resting position that doesn’t require use of the hands. Offwidth A crack that is too wide to jam but too narrow to climb inside. Open Hand Gripping a hold with the fingers only slightly bent. Opposition Creating tension either by pulling a pair of holds that face away from each other or pushing on a pair of holds that face each other. Outside Edge The curved section of a climbing shoe between the tip of the big toe and the side of the little toe. Over Gripping Holding on with the hands harder then necessary, wasting strength and energy. Overhanging Rock that is steeper than vertical. Palming Pressing the palm of the hand onto the rock. Parkour A physical discipline that focuses on movement around obstacles by vaulting, rolling, running, climbing, and jumping (AKA free running). Patioing Improving a landing by shifting rocks. Pebbles Tiny stones protruding from the surface of the rock, most common on gritstone. Pinch A hand hold that is squeezed between the fingers and thumb. Pocket A hole in the rock that can be used as a hand or foot hold. Power Endurance The ability to do multiple hard moves in a row. Powerspot When the spotter takes some of the climber’s weight so they can get the feel of a move. Pof Dried pine resin that is wrapped in a cloth and slapped onto hand and foot holds. It’s used by a minority of climbers in Fontainebleau but most climbers consider it very damaging to the rock (AKA resin). Project A problem that has been attempted but hasn’t yet been climbed or a problem that an individual is working towards climbing ie. a personal goal. Prow A narrow overhanging arete. Pumped When the forearms become filled with lactic acid after a bout of hard or sustained climbing. 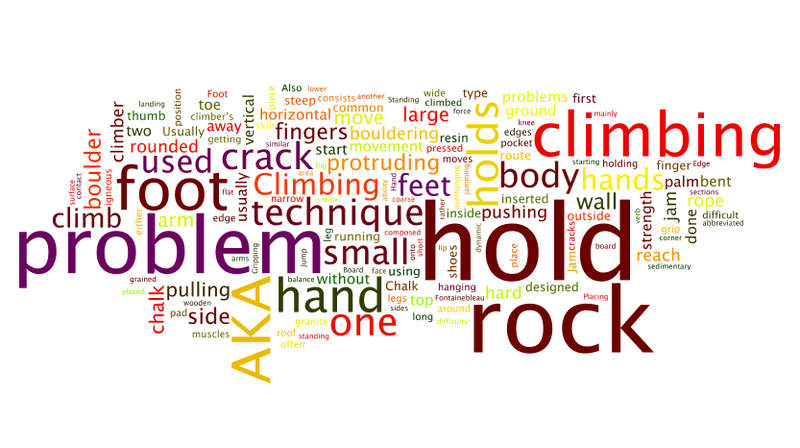 Reading Analysing how to climb a problem. Red Herrings Holds that aren’t essential to the sequence and only serve to distract and confuse. Rockover Placing a foot on a high hold and standing up on it using a combination of pulling with the arms and pushing with the legs. Roof An approximately horizontal piece of rock. Rubber The sticky compound that is used on the soles of climbing shoes. Run and Jump A dynamic technique that involves running at the rock, kicking off one or more foot holds and jumping for the hand holds. Sandbag A problem that is given a significantly lower grade than it deserves. Also a verb, to sandbag, which is to underplay the difficulty of a problem. Sandstone A sedimentary rock composed mainly of sand-sized minerals or rock grains. Screw On A very small artificial hold, that is screwed rather than bolted to the surface of a climbing wall. Usually used as a foot hold. Seam A narrow or closed crack. Send To successfully climb a problem. Sequence The details of how a problem is climbed (AKA beta). Share To place both hands on the same hold simultaneously. Sidepull A vertical hold that faces away from the body. Sit Start To start a problem from a sitting position, sometimes abbreviated as SS or SDS (sit down start). Slab A less than vertical piece of rock. Slap A quick reach or lunge during which there is a minimum of two points of contact at all times. Sloper A rounded or sloping hand hold. Slot A narrow horizontal pocket. Smear A sloping foot hold. Used as a verb it means to place a foot flat against the rock. Soloing Climbing a route without a rope. The complete term is free soloing. Splitter A long, parallel sided crack. Spotting Guiding a falling climber safely to the ground. Sport Climbing Routes that are protected by clipping the rope to permanent bolts. Sprag A grip in which the thumb pushes the rock above the fingers to create more downward force. Squat An exercise for developing leg strength. Squeak To thoroughly clean the sole of a climbing shoe. Stalactites A limestone tooth that hangs from the ceiling of a roof. Stamina The ability to do a large volume of climbing. Static To do a move slowly and in total control. Stemming Pressing the legs away from each other to create an opposition force that holds the body in place. Usually done in corners or grooves but can be done between two protruding holds (AKA bridging). Stepping Through Standing (usually with the outside edge) on the next foot hold with the foot furthest from it. Syenite A coarse grained igneous rock of similar composition to granite but with a very low amount of chalk. Systems Board A steep board on which the various hold types – pinch, crimp, sloper, pocket, undercut, sidepull – are laid out in a repeating, symmetrical pattern. Taco A type of bouldering pad that consists of one continuous section of foam that bends in the middle for transporting. Technical A problem that demands a high standard of technique and movement skills. Technique Can refer to either a specific type of movement or more generally to a climber’s movement skills – “she has good technique“. Tennis Elbow Aches and pains in the outside of the elbows caused by a lack of balance between the pushing and pulling muscles. Thumbcatch Improving a hold by pinching the underside of it with the thumb. Tickmark A small chalk mark that indicates the location of a hard to see hold. Toe Hooking Using the top of the toe to pull on a hold. Topo A map or photo upon which the line taken by a problem (or problems) is marked. Top Out The process of getting stood up on the top of a problem. Indoors you usually jump down from the finishing hold rather than top out. Top Rope Anchoring the rope at the top of the cliff or boulder so that the climber can climb in safety. Trad Climbing Climbing a route protected by gear that has been placed by the leader. Training Board A small, steep wooden climbing wall (AKA woodie). Traverse A problem that travels predominantly sideways. Turning the Lip The process of getting from hanging from the lip of a roof to standing on the lip. Twist-locking A technique for climbing steep ground in which the torso twists perpendicular to the rock to maximise reach. Undercut A downward facing hold (AKA undercling). V Grade An American system for grading problems, consisting of a number prefixed by the letter V, the higher the number the more difficult the problem. Velcros Climbing shoes that are fastened with velcro straps. Volcanic Tuff A rock type consisting of consolidated ash ejected from a volcano. Volume A large, hollow plywood or resin hold (usually triangular or rounded), upon which other holds can be mounted. Wall A roughly vertical piece of rock. Warm-up A routine to prepare the mind and body for climbing. Wire Brush A very aggressive wire bristled brush that should never be used to clean rock. Wired Having a problem mastered (AKA dialled). Working Figuring out and rehearsing the moves of a problem.